In the era of the globalization, ‘becoming global’ has become a challenge to each individual nation especially developing ones. This term is used extensively in various sectors, including politics, economics, culture, and education. It refers to the development of increasingly integrated systems and relations beyond individual nations (Marginson & Rhoades, 2002), systems that are more than economic but also political, cultural, and technological (Held, McGrew, Goldblatt, & Perraton, 1999). As a concept, globalization refers both to the compression of the world and the intensification of consciousness of the world as a whole. It simply connotes that the world is rapidly being molded into a shared social space by economic and technological forces and that developments in one region of the world can have profound consequences for the life chances of individuals or communities on the other side of the globe” (Held et al., 1999). However, to survive in this global borderless world each individual state needs to grasp the essence of globalization, which is not limited to national economies and national states, but contained in a new way of thinking regarding economic and social space and time (Carnoy, 1999). In addition, a new vision of the nature of power relations is required in terms of political, economic relations and cultural influence (Stromquist & Monkman, 2000). These new stipulations have become hegemonic because of the rapid global technological innovations that have placed greater demands on all education systems (Marginson, 1999). Education is expected to lead a knowledge-based learning process that fosters constant seek for new information, critical thinking, and self-learning. Countries all over the world have responded to these challenges in different forms and at varying levels to enable their coming generations to adapt to these changes through rushing in integrating Information Communication Technologies (ICTs) into education. Knowledge is fundamental to becoming global, and in return, globalization has a profound impact on the transmission of knowledge that consequently calls for a major transformations in all education systems all over the world (Carnoy & Rhoten, 2002). Although the forces of globalization seem to be determinative in its needs and expectations; yet it can live alongside with a range of existing national and local institutions and combine with them in a range of ways to obtain the desired ends. This means that indigenous education systems can reserve its authenticity while grasping the essence of globalization inherent in ICT (Dale & Robertson, 2002). From this viewpoint, the researchers in this paper try to comprehend the ideological framework within which Malaysia has founded its ICT mediated education. They look at Malaysia as a rewarding case study in adopting the Smart Educational System to prepare a highly skilled Malaysian work force that is capable of placing Malaysia among the top Information Societies in the world and contribute significantly to their society's prosperity and welfare. Therefore, the researchers intend to synopsize lessons, from Malaysia's experience with Smart School, applicable in the Egyptian setting, so that researchers, policy makers, administrators, and teachers can objectively assess Egypt's newborn Smart School system. Literature recognizes the importance of knowledge and its accumulation as a unique source of authentic technological progress, innovation, and economic growth. For instance, in Lucas (1988) model, knowledge accumulation is vital for the growth process, for knowledge creation, accumulation and acceleration, contribution to scientific and technological progress, innovation, economic growth performance and development (Lucas, 1988). In defining ‘knowledge’ the literature makes a distinction between codified and tacit knowledge (Dasgupta P, 1994). “Codified knowledge implies that knowledge is transformed into information which can either be embodied in new material goods (machines, new consumer goods) or easily transmitted through information infrastructure. While, the tacit knowledge refers to that which cannot easily transferred because it has not been stated or measured in an explicit form, skill is an important kind of tacit knowledge (Freeman & Soete, 1997). Furthermore, the definition of codified knowledge in the literature is closely related with investment in public spending on education, training, research and development (R&D), and ICT. Several studies perceive knowledge as a public commodity, produced through R&D activities that generated spillover and thereby increasing returns (Grossman & Helpman, 1994; Romer, 1994). Other studies use broader terms to interpret knowledge created and embodied in institutions, for instance, Langlois (2001), Nelson (1993), and Lundvall (1992) emphasize the importance of institutions for the flow of knowledge and information to innovation capability. “R&D is but one component of knowledge and innovation expenditures, and by no means the largest. Because, R&D data tend to either overemphasize the discovery of new scientific or technical innovations, or the exclude a wide range of activities that involve the creation or use of new knowledge in innovation” (Ergazakis, Metaxiotis, & Psarras, 2006). Some empirical studies indicate that the survival and growth amongst nations is determined by/or at least influence by differential ratio of investment in knowledge (Klepper & Simons, 1997) or intersectoral differences in the size and R&D intensity of nations (Levin, Cohen, & Mowery, 1985). In addition, (Brusoni, Marsili, & Salter, 2005) and (David & Foray, 2002) show that an increasing codification of knowledge stock would increase a nation's innovative performance. In addition, differential in the productivity and growth of different countries is significantly related to the improvement in the quality of human capital, technical progress, factors of production, and the capacity to create new knowledge and ideas and incorporate them in equipment and people. Literature shows increasing evidences of the growing relative importance of intangible capital in total productive wealth and the rising relative share of GDP attributable to intangible capital” (Abramovitz & David, 1996; Abramovitz & David, 1998). Intangible capital largely falls into two main categories: on the one hand, investment geared towards the production and dissemination of knowledge (i.e. training, education, R&D, information and coordination); on the other hand, investment geared to sustain the physical state of human capital (health expenditures). For instance in the US, the current value of the stock of intangible capital (devoted to knowledge creation and human capital) began to outweigh that of tangible capital (physical infrastructure and equipment, inventories, natural resources) at the end of 1960s. Moreover, since 1960s annual investment rated in R&D, public education and software have grown steadily at an annual rate of 3% in the OECD (Organization for Economic Cooperation and Development) countries” (David & Foray, 2002). (Drucker, 1998) also stresses that, “Knowledge is now becoming the one factor of production, sidelining both capital and labor”. In addition, the OECD (1999)has suggested “…the role of knowledge (as compared with natural resources, physical capital and low skill labor) has taken on greater importance”. Ergazakis et al. (2006) argue that in recent years, learning and knowledge have attracted increasing attention as a result of the claims that knowledge-intensive industries are now at the core of growth, knowledge driven economy or even a knowledge society. The role of knowledge as an input to economic process has fundamentally changed, probably due to rapid technological changes/ advances in ICT; ICT seen as factor increasing knowledge and increasing the common availability of codified knowledge (David & Foray, 2002; Ergazakis et al., 2006). Van Zon (2001) extends Lucas 1988 model by incorporating the effect of ICT — capital investment and assuming that ICT has positive influence on growth performance, both by improving the intensity of production and total factor productivity and enhancing the efficiency of knowledge accumulation and learning process (2001). Knowledge also relates positively to human capital (mainly tacit skill or skill level). Winter (1987) suggests that tacit and codified knowledge need not be substitutes, but can be seen as complements in the learning process. Brusoni et al., (2002) show a strong positive relationship between the codification of the knowledge base of the industry and its investment in skilled people (high level of investment in tacit skills). This also indicates a substantial contribution to economic growth and public welfare that can be related to the overflow of knowledge (Arundel & Geuna, 2001. pp. 3-5; Hagedoorn, Link, & Vonortas, 2001). The transformation of traditional schools into smart ones must change the focus of school toward the production of both tacit and codified knowledge and the associated skills. The meaningful integration of ICT into education requires a profound transformation in the ideological conception of all stakeholders involved in education. Assessment and monitoring strategies are crucial to put the implementation of Smart Schools on the right track. A Smart school is an initiative for making school system relevant to the changing nature of the workplace. This means that, the school experience looks for building up a highly competent workforce who is able to assimilate information and transform them into new products. Classroom practice hence will focus on turning students into knowledge consumers and producers in a lifelong learning cycle (Duta, 1999). In this context, school activities have to shift focus from the teacher to the learner. In other words, emphasis of teaching-learning in schools has to shift from specific knowledge to enabling students in constructing their knowledge by asking questions, reading, exploring, daydreaming, formulating and testing hypothesis, communicating what they learn and by practicing skills (Kirschner & Davis, 2003). In other words, the learning process should move away from the memory-based rote learning designed for the average students, to education system that stimulates thinking, creativity and caring. Learning will thus be self-directed, collaborative, individually paced continuous and reflective, utilizing teaching materials that are not only limited to print books, but also include electronic books, multimedia software, course ware catalogues and data bases (Halim, Zain, Luan, & Atan, 2005). This means that learning should be crafted to be student-centered operation that caters to individual differences and different learning styles, and create possibilities for an appropriate mix of learning strategies that enable students to achieve basic competencies and promote a holistic development (Sharif & San, 2001). Within this context, technology is indispensable for the success of this new learning process. Multimedia courseware, presentation facilities, and e-mail are required in classroom settings, while library/media centers and computer laboratories are the resources that will facilitate learning and teaching. Technology enables the schools to expand their external resources, such as public and university libraries, companies and industry associations, museums and other archives. Technology also provides a bridge between schools and the outer community as it makes communication more effective and easy (Jen & Huang). David Perkins and his colleagues at Harvard Project Zero emphasis, that the learning process in Smart Schools is centered around good thinking, deep and flexible utilization of knowledge to solve problems (Project Zero, 2003). This means that, Smart Schools will attempt to fulfill certain expectations as: 1) children in such schools will be encouraged to search for information and construct knowledge through a dynamic process of learning. 2) Teachers will function as mentors and facilitators of children's learning rather than merely providers of abstract meaningless knowledge (Nadu, 1998). Malaysian 2020 Vision acknowledges the fact that information is now considered a wealth generator, not just in terms of contributing to economic performance, but as a major contributor to service base and knowledge base industries. Seven flagship applications were introduces in 1997 as part of the overall plan to develop the Multimedia Super Corridor (MSC) (Asian and the Pacific Regional Bureau for Education, 2004). The previous Prime Minster Dr. Mohamad’s MSC plan reflects Malaysia understanding of the transforming power of ICT that stems from two related, but distinctly dynamic, global process (Prakash & Hart, 1999). First, the current global economy intensifies the global market operating across and among system of national labor markets through international economic competition (Davies & Guppy, 1997). Market competition, technological change, and multinational corporations are sources of this global economy (Carnoy, Castells, Cohen, & Henrique, 1994). Trade and investments are organized across a set of cross-national networks beyond the specific control of any one nation-state, facilitating a convergence of national economic institutions and reducing obstacles for cross-national economic interests. A world market and formal multinational markets generate flows of capital, labor, goods, and information (Astiz, Wiseman, & Baker, 2002). Second, institutional globalization, is characterized by convergence toward a uniform model of polity and of rationalization (Guppy, Meyer, Boli, & Ramirez, 1997). At the heart of this transformation is the convergence of formal national institutions toward worldwide goals and operating structures. This covers the descriptions of schools, health care, social welfare, and justice system. Institutional convergence tends to create isomorphic politics, reinforcing uniform patterns among organizational structures in theses sectors (DiMaggio & Powell, 1991). Evolving from this recognition, Malaysia (MSC) aims to revolutionize how Malaysia does business. Located at the hub Asia’s fastest growing markets, the MSC is founded to unlock multimedia full potential by integrating groundbreaking cyberlaws and outstanding information infrastructure in an attractive physical environment. The MSC is a regional launch site for companies developing or using leading multimedia technology allowing these innovators to harness Malaysia’s unique competitive advantages that arise from its multicultural links, committed leadership, and proven record of accomplishment in developing products and services for regional and global markets (Drucher, 1999; Internet Usage in Asia, 2003; The Malaysian Government, 1997). The MSC brings together the several key elements (The Malaysian Government, 1997). The best possible physical infrastructure, including Kuala Lumpur City Center, a new world class airport and integrated logistic hub, rapid rail links to Kuala Lumpur, a smart highway, and tow intelligent garden cities. New laws, policies, and practices designed to enable and encourage electronic commerce, facilitate the development of multimedia applications, and position Malaysia as the regional leader in intellectual property protection. High capacity global telecommunications infrastructure built on MSC 2.5-gigabit-to-10-gigabit digital optical fiber backbone and using Asynchronous Transfer Mode (ATM) switches to provide fiber to the building. This network has a 5-gigabit international gateway with direct links to the US, Europe, and Japan, as well as the other nations in South Asia. The Multimedia Development Corporation (MDC) — a one-stop Shop created to manage and market the MSC. The MDC’s mission is to create the best environment in the world for private sector companies to pursue multimedia and to facilitate their investment in the MSC. The MDC is a high powered ‘one-stop super shop’ wholly focused on ensuring the success of the MSC and the companies operating in it. Smart Schools responsible of achieving a sustained productivity-driven growth that can be achieved only with a technological literate workforce that is capable of critical thinking and is prepared to participate fully in the global economy. “Education in Malaysia is an on-going effort towards further developing the potential of individuals in a holistic and integrated manner, so as to produce individuals who are intellectually, spiritually, emotionally, and physically balanced and harmonious, based on a firm belief in and devotion to God. Such an effort is designed to produce Malaysian citizens who are knowledgeable and competent, who posses high moral standards, and who are responsible and capable of achieving high levels of personal well-being as well as being to contribute to the harmony and betterment of the family, the society and the nation at large.” (Malaysian Ministry of Education). Malaysian society puts a high premium on education and looks upon education as an important mean of social mobility and economic advancement across lines of class and ethnicity (Bajunid, 2001). Therefore, elevating the standards of education is perceived as one of the strategies of nation building (Pope, Musa, Singaravelu, & Bringaze, 2002). In 1995 the Ministry of Education in Malaysia formalized its mission statement that reflected its commitment to accomplish the goals of Vision 2020: “To develop a world class quality education system which will realize the full potential of the individual and fulfill the aspirations of the Malaysian nation” (Malaysian Ministry of Education, 1997a). To fulfill this aspiration, Yang Berhormat Tan Sri Dato’Seri Musa Bin Mohamad the Minister of Education in Dr. Mohammad’s government in his speech at the opening ceremony of the 31st IASL conference in 2002 sets the standards for education in Malaysia. He emphasizes that in a knowledge society; literacy should not only be considered the ability to read and write but should reflect a wider connotation to include computer literacy (Mohamad, 2002). Onwards, ICT in education has become tools and enablers to make learning more interesting, motivating, stimulating, and meaningful to students. The teaching and learning materials using ICT is redesigned to accommodate differing needs and abilities, resulting in fuller realization of their capabilities and potential, and allowing children to take greater responsibility for managing their own learning (Ismail, 2003). On the broader context, ICT, as perceived by the Malaysian Ministry of Education, has become a tool to revolutionize learning, to produce richer curricula, to enhance pedagogies, to lead to more effective organizational structures in schools, and to produce stronger links between schools and society to empower learners. Therefore, the ministry has invested ICT in education to reduce the digital gap between schools. ICT is used in education as a teaching and learning tool, as part of a subject, and as a subject by itself. On the administrative level, ICT is used to increase productivity, efficiency, and effectiveness of the management system (2003). The Malaysian government introduced various initiatives to facilitate greater integration of ICT to enhance the effectiveness of education and training programs. This was outlined in the country’s ICT Master Plan, finished in 2001(UNESCO, 2003). The long-term vision of the plan, Vision 2020, calls for sustained, productivity- driven growth, possible only with a technologically literate, critical thinking workforce, prepared to participate fully in the global economy of the 21st century. At the same time, Malaysia’s National Philosophy of Education calls for developing the potential of individuals in a holistic and integrated manner, so as to produce individuals who are intellectually, spiritually, emotionally, and physically balanced and harmonious (Belawati, 2004). From this vision and with determination the Malaysian Smart Schools emerge. In 1996, the Ministry of Education involved in intense discussion bout the concept and principles of the Malaysian Smart School. The general consensus at that time was that Malaysia educational system needed to be reinvented to enable students to become lifelong learners, and to be able to practice self-paced, self-success, and self-directed learning (The Malaysian Smart School Project, 2004). In July 1997, a blueprint describing the key components of the Smart school had been drawn up. The Smart School blueprint is a descriptive document, meant to be open and evolutionary refinement, including advances in pedagogy and improvements in ICT(Malaysian Ministry of Education, 1997a). In addition, the task force also produced an Implementation Plan with an implementation strategy and roadmap for a three-year pilot project to be followed by a broad rollout to the rest of the country (Smart School Project Team, 1997). The conceptual blueprint was produced by a project team, which consisted of industry representatives, officials from the Multimedia Development Corporation (MDC), and the Ministry of Education. A joint venture company, Telekom Smart School Sdn Bhd (TSS), was incorporated in June 1999. The joint venture partners were Telekom Multimedia Sdn Bhd, Sapura Telecommunications Bhd, Educational Trend Sdn Bhd, DEMC Anzagain Sdn Bhd, Digital Technologies Sdn Bhd, Custommedia Sdn Bhd, Multi Media Synergy Corp. Sdn Bhd, BT Multimedia (Malaysia) Sdn Bhd, Electronic Data Systems IT Services (Malaysia) Sdn Bhd and NIIT Malaysia Sdn Bhd (Forst & Sullivan). The government awarded the TSS the contract for implementing the Smart School solution at ninety pilot schools nationwide. The Smart School Pilot Project (SSPP), conducted between 1999 and 2002. The project was successfully piloted in 87schools located in all 15 states of Malaysia, including Sbabah, Sarawak, and Labuan, across the South China Sea from Peninsular Malaysia (Mae, 2004). Prior to conducting the pilot study, extensive consultations with education policy makers and other experts, at all levels, within and outside the Government were undertaken to map out the plan Smart Schools. In connection with this, first hand observations were made of how ICT facilities in the schools are currently being used, and if their utilization is in accordance with existing policy. The goal is to complete the implementation in all Malaysian schools by the year 2010 (Foong-Mae, 2002). The Federal Government provided the $ 78 million (RM 300million) required to carry out the Smart School Pilot Project (SSPP) was provided by the Federal Government. The Ministry of Education shouldered the cost of setting up the Smart School Network, and provided the software necessary for development of school websites. The schools were allowed to purchase their own software to upgrade their respective websites. Maintenance, expansion, and upgrading costs will also be borne by the MOE. The budget was a serious consideration in determining network design, particularly, in regards to server capacity and the schools and the Data Center, and bandwidth allocations. The budget was divided to cover need in four main domains (2002): (1) Browser-based teaching and learning courseware materials, (2) a computerized Smart Schools Management System (SSMS), (3) a Local Area Network (LAN) for the pilot schools and virtual private network that connects the pilot schools to the Data Centre and Help Desk of the Ministry of Education. Support services in the form of a centralized, and (4) specialized services such as systems integration, project management, business process re-engineering and change management. The Smart School Conceptual Blueprint (Smart School Project Team, 1997; The Malaysian Government, 1997)sets seven objectives (1) to provide all-round development of the individual, (2) to provide opportunities to enhance individual strengths and abilities, (3) to produce a thinking and technology-literate workforce, (4) to democratize education, and (5) to increase participation of stakeholders. This requires a new curriculum that emphasizes seven learning areas (1) language and communication, (2) science and technology, (3) social studies, (4) physical and health development, (5) vocational and personal awareness, (6) practical and creative arts, and (7) values and development. Learning areas present a very important concept in the Smart Schools. They are designed to help students achieve overall and balanced development with which goals are aligned. Such objectives signal that the Malaysian Smart School are intended to be different from any existing Smart Schools anywhere around the world. This stems from two main factors shaping the current education system in Malaysia and will continue in the Smart School: firstly: the National Philosophy of Malaysian Education that will be the main component of the Smart School curriculum. Secondly, the moral values that have been stressed in present curriculum and will go on into Smart Schooling. These two foundations of Malaysian Education will not be negotiable in the Smart School curriculum (Nasirum, 2001). Upon that, the objectives of the Malaysian Smart Schools have articulated to serve in development of loyal united Malaysian nation who believe in God and possess high moral standards, knowledge competence, and who are capable of achieving high personal well being. On the other hand, it is expected that Smart Schools will provide all the Malaysian children with equal access to a high quality educaiton (UNESCO, 2004). Throughout the pilot phase of the Smart Pilot Project, network use was promoted by organizing a series of competitions for students and teacher for the best websites, and buy encouraging them to work with other schools in developing their websites. The pilot project further promoted awareness and encouraging collaboration by successfully creating a Smart School Network community. Communications among members, and between the team and the schools, are mostly conducted through e-mail exchanges (Mae, 2004). In order to insure transparency and accountability a steering committee was defined, and important organizational structures were structured and working relationships were established. The Smart School Pilot Project team coordinated the Smart School Network during the pilot phase. The team was composed of system analysts and educators trained in computer science. They worked with different MOE departments, each with specific experience and areas of responsibility. The MOE departments included the Information and Technology Division, Curriculum Development Center, Teacher Education Division, and the Aminuddin Naki Institute. A consortium was selected to develop the Smart School Integrated Solution. The consortium was primary involved in installing, testing, and maintaining the network together with the project team, developing the course and computerized software and security requirements, and providing troubleshooting services (Mae, 2004). Broadly, we can assert that the Malaysian Smart Schools have successfully regained excellence and accountability in Malaysian education. They have managed in addressing some relevant issues such as (1) management and administration; (2) people, skills and responsibilities; (3) technology; (4) processes; and (5) policies (Huang, 2000; Jen & Huang). This endeavor has paid off is Malaysia success in reconstructing its economical system to be a mixture of private enterprise and public management. This economic structural adjustment has caused the Malaysian economy to grow by an average nine percent annually between 1988 and 1996, and this growth resulted in a substantial reduction in poverty and a marked rise in real wages. By 1996, Malaysia had become one of the fastest growing economies (Drucher, 1999). As an information-based society, Malaysia now ranks the 17th in the top 25 countries of Internet users. The growth of ICT users in Malaysia from 2000 to 2003 was over 50 percent increasing the number from around the 3.7 million to 5.7 million users. The percentage of the total number of Internet users to the total population is around 24 percent. This is much higher than Internet penetration is other ASEAN countries such as Indonesia (two percent) that ranks 21st and Thailand (5.7 percent) that ranks 25th (Internet Usage in Asia, 2003). One likely factor that contributes to the greater Internet use in Malaysia is the high fixed telephone connection with 66 percent of Malaysian households having phones(International Telecommunication Union (ITU), 2002). In addition to that, Malaysia now ranks 8 in the AT Kearney's Global Services Location Study (AT KEARNEY, 2007) for the most attractive countries to provide share services and outsourcing. In the same report, Egypt ranks 14. Yet the report affirms that the Egyptian market is still attractive. While Egypt has seen tremendous growth in the ICT sector in the last years, this was the beginning of a larger change in the country. The last decade have witnessed 30 billion invested in ICT companies, and an overall growth in the industry of 700 percent. The number of companies in sector exceeds 1570 companies employing approximately 35,000. However, despite all these achievements, Egypt is still facing many major barriers such: accelerated population growth, which formed a consequent pressure on the labor market, deficiency in education and health care services, serious shortage in housing and utilities infrastructure. Egypt has to face these challenges in the middle of changing global conditions, where trade borders are vanishing and competition is increasing in every sector. Success under such conditions has become a sign of the country’s ability to survive (Egypt Ministry of Communications & Information Technology, 2005b). Egypt has embarked on large ICT development programs starting from 1999. The Ministry of Communications and Information Technology (MCIT) was formed in 1999 to facilitate Egypt’s transition into the global information society, building upon existing endeavors such as the Information and Decision Support Centre (IDSC). MCIT was entrusted with the task of creating an Egyptian Information Society with initiatives in to prepare the National Plan for Communications and Information Technology. MCIT’s plan gears to support and empower the Information Society in Egypt in close coordination with relevant government agencies and with the private sector. These commitments are translated into developing and expanding the telecommunications infrastructure, establishing hundreds of information centers, expanding the pool of IT skilled labor and creating information systems and databases among governmental and private entities. These initiatives were outlined in Egypt ICT National Plan (1999/2000–2001/2002) that paved the way for the initiation of the Egyptian Information Society Initiative (EISI) in 2003(United Nations Economic and Social Commission for Western Asia (ESCWA), 2005). The Information Society should enable all citizens to have easy and affordable access to the opportunities offered by new technologies. Developing an appropriate communication infrastructure is a prerequisite for achieving this universal access. ICT is a complementary tool for higher standards of education at all levels and for upgrading the skills and productivity of the citizenry. This initiative aims to promote the use of ICT in education and to develop a new generation of citizens who understand and are comfortable with the use of ICT in their daily lives. The Information Society should be able to deliver high quality government services to the public where they are and in the format that suits them. The goal of this initiative is to reach a new level of convenience in government services, offer citizens the opportunity to share in the decision making process, and greatly improve efficiency and quality. ICT is an important tool for robust economic growth. With the creation of new technology-based firms, the improvement of workforce skills, the use of electronic documents, and the development of e-payment infrastructure, ICT can be a significant catalyst to increase employment, create new jobs and improve the competitiveness of Egyptian industries. This initiative is designed to foster the creation of a new industry evolution in e-commerce and e-business. The application of ICT in the health sector could provide a better quality of life to the citizens and a more efficient work environment for physicians and health care workers. ICT can be used wherever it has a clear added value, such as reaching remote populations, providing continuous training for doctors, and offering the tools for building a national health network. ICT is used to document Egyptian cultural identity through the use of tools to preserve manuscripts, archives and index materials, offer worldwide access to cultural and historical materials, and generate and promote interest in Egyptian cultural life and heritage. The success of these seven initiatives depends on several critical factors including: strong governmental support; a suitable legislative and investment environment, as well as a state of the art infrastructure and investment in human resources. The launching of such civilization project includes the development of an advanced information infrastructure, the preparation of a well educated and skilled workforce, and an institutional credible and accountable regime to provide incentives for efficient use of knowledge (Egypt Ministry of Communications & Information Technology, 2002). To reinforce the country's e-readiness the initiative also promises unified e-strategies formulated on the national level to set a credible national ICT plan that places heavy emphasis on joint public-private partnership efforts and the role of civil society for long-term success(Kamel, 1997). One of the applications of EISI is Egypt's ICT Trust Fund Project. This project targets to foster Egypt’s sustainable human development through increasing computer literacy and skills among school children across Egypt, improve citizen’s access to services and information and reduce male and female illiteracy. It comprises of five sub-projects which support efforts to provide people with opportunities to use information technology (Egypt Ministry of Communications & Information Technology, 2006a). One of these sub-projects is The Smart School Network (SSN). The Smart School Network (SSN) Project (Egypt Ministry of Communications & Information Technology, 2006b)was launched in 2003. The main objective of the SSN Initiative is to allow Egyptian students to achieve “computer literacy” after completing preparatory school (i.e. middle school) while enhancing student creativity, enabling them to cope with the requirements of the modern workplace, both in Egypt and abroad. The initiative not only aims to orients students to the concepts of information technology but also to introduce interactive methods in education. The SSN project consists of two phases: The first phase of duration 5 years covering 7500 preparatory school with 4.5 million students. This phase started in September 2003 with a pilot project for 60 schools covering 13 governorates distributed as 30 governmental and experimental schools, 20 private schools and national institutions, and 10 schools in cooperation with the Education Development Program in Alexandria. The second should cover most primary and secondary schools allover the country. The number of students benefiting from this service is 11 million (2006b). SSN is crafted to contribute to the development of the educational system through introducing new concepts of communication and IT in Egyptian schools to improve the quality of the schooling process. Students are granted a minimum of four hours per week one to one access, and teaching is performed in modern classrooms, where material can easily be presented digitally. Attention is also been paid to the provision of multi media peripherals such as digital cameras, scanners and sound devices, and a digital library in each school. The schemes are aiming for a ratio of one computer per ten students. There is encouragement that after school hours the School computer centers can function as Internet cafés and business centers for the local community. The establishment of an internal network connecting the various departments and computer laboratories inside the school is also a fundamental target of the project, along with allowing access for parents, teachers, students, and other schools, to provide a general forum of operation. The system is being called the Smart Schools Portal(Egypt Ministry of Communications & Information Technology, 2007). Teachers are the first beneficiaries from this transformation of schools' labs into training centers, where schools organize and administer training programs for their teacher qualifying them for the International Computer Driving License (ICDL). It is hoped that the level of basic ICT awareness will increase rapidly, and that computer literate graduates will be able to progress to obtaining the ICDL. It will also encourage both teachers and students to grasp the concepts of self-learning and knowledge education, and will aid them to collect further skills. At the end of the day, the concept of Smart School will lead to the modernization of the meaning of education in Egypt(Egypt Ministry of Communications & Information Technology, 2007). Egypt's SSN will prove itself a successful example of using the Multi Stakeholder Partnership (MSPs) concept to drive the initiative, as benefits will distributed equally among the Ministry of Education, private ICT companies, and of course the schools and students(Egypt Ministry of Communications & Information Technology, 2005b). Through MSPs different national and international agencies are involved in promoting, facilitating and stimulating the creation of innovative enterprises capable to take full advantage of ICTs while enabling new mechanisms for funding and support of market creation and access. In these endeavors, the ICT Trust Fund saw fit to engage Non-Governmental Organizations (NGOs) as major stakeholders to stimulate more e-Access projects based on community ideas. This funding strategy targets to empower communities by providing access to appropriate information, and through the involvement of different local organizations and NGOs in running and monitoring the nation’s ICT project. The infrastructure cost of the SSN project is estimated as $80, 000 for each school, in addition to $20,000 for annual operation costs for each school as well. The annual cost of each student will be $150. This brief overview of Egypt's efforts to adopt the smart system into its education reveals the fact that, Egypt's ambition smart school plan still require exclusive timed action plan. Governmental documents point out that Egypt is still working on the first phase of the SSN project, the infrastructure phase where the project is working on providing schools with computer labs, connecting schools with a strong local area network (LAN) and wide area network (WAN), and enrolling all those who are involved in the education process in computer training programs. Therefore the final part of our study we dedicate it to draw lessons from Malaysia's advanced experience with Smart school to pave the road for the full blossom of the Egyptian Smart Schools. In light of the previous discussion, we realize that in today's world, economic and social empowerment rests on the ability to access, gather, analyze and utilize information and knowledge to increase individual choices for political, economic, social, cultural, and behavioral decisions. ICT are the conduits which transmit information and knowledge. By integrating technology into development planning, more effective and speedy solutions can be reached for economic growth and sustainable human development (UNPAN, 2004). Therefore in the past few years, educationists and policy makers allover the world have been debating on how information technology can facilitate a scientifically correct teaching process that encourage innovation and creativity while empowering students by enabling them to use and contribute to the world's collective knowledge (UNDP, 2002). Drawing on these principles, the Malaysian and Egyptian Smart School Projects attempt to reinvent the teaching/learning process in an effort to meet the two countries' broader goals of transforming their predominantly industrial and agricultural economy into a knowledge economy. The projects continue to be a critical component of both the Malaysian and Egyptian governments' plans that envisage the creation of high-value jobs, achieve high and constant growth driven by exports, improve national productivity and competitiveness, and achieve value creation. All these would eventually translate into transforming the two societies into prosperous IT societies (European Commission, 2000; Gitta, 2001). They are both inspired by the notion that if nations could somehow manage to offer technology infrastructure in schools, a new generation will emerge, gain access, and partake of the economic bounty being created by the global knowledge economy. Yet, technology infrastructure is necessary, but not sufficient to achieve real access for opportunity. 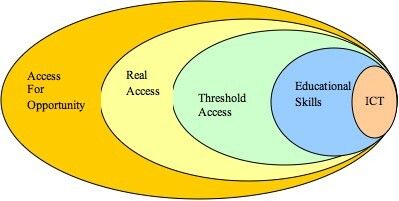 The next figure," The Access-for – Opportunity Model" (UNPAN, 2004), maintains that physical access to ICT is only the first step towards building real access, which leads to opportunity. Access must be blended with relevant and culturally appropriate content for onward transmuting into knowledge. The blended knowledge is processed and utilized to create opportunity for economic and social empowerment. In a study conducted by Foster and Sulivan (p.10), they stress the fact that Malaysia today presents a model for ICT-mediated education in developing countries, where ICT has created real opportunities for Malaysians. Therefore, they strongly recommend that other developing countries should follow Malaysia Smart School's road map to figure out what can be possible, to predict the problems that they may eventually face, and learn how to overcome them. Consequently, we like to invest our previous scrutiny of the Malaysian and Egyptian Smart School system to synthesis the following four lessons that we hope to lead and put the Egyptian Smart School on the right track. Malaysia and Egypt hold the same vision for Smart Schools, yet each has adopted a different approach in transforming this vision into reality. Malaysia has adopted the "simultaneous approach" while Egypt has adopted the "sequential approach" (Forst & Sullivan). Malaysia's simultaneous approach has transformed the implementation of the Smart School into a unique national effort in educational innovation that is intended to restructure the existing form of school management and the educational delivery (Huang, 2000). The 90 schools Malaysia has set as inspiring models for all other schools to use as benchmark references, throughout the pilot phase, have fueled the community and the families to fully support the transformation of all Malaysian traditional school into Smart Schools. Moreover, the conclusive dedication of the Malaysian government to the Multimedia Super Corridor project has secured sustainability and accountability to the Smart School project that cultivated and nurtured an enabling environment for stakeholder participation, to broaden network objectives in response to new emerging needs, and to introduce a wide range of improvements and upgrades as the Smart School operations expand. a Smart Schools technology infrastructure involving the use of information technology (IT), non-IT equipment, and Local Area Network. Meanwhile, in Egypt ICT mediation began as small-scale projects. Starting with building some sort of ICT infrastructure in schools accompanied by professional development of teachers. The next step is expected to embrace an expansion in the communication infrastructure, and online content leading, at the end of the process, to the occurrence of a smooth comprehensive integration of ICT into education. Therefore, Egypt must learn from Malaysia that any authentic, sustained, and nation-wide initiative in the educational sector calls for a holistic vision and requires responses form all participants in the education process. Without such partnership, any government vision will remain just a rhetorical vision. It must be affirmed that Smart School depends, in the first place, on stakeholders, such as teachers, administrators, Ministry of Education officers, curriculum developers, IT support staff, and parents (Jen & Huang). ICT is the catalyst in the process of transforming traditional schools into Smart Schools. In other words, technology is indispensable for the success of the Smart School concept (Ramasamy, Chakrabartya, & Cheahb, 2003). Multimedia course-ware, presentation facilities, and e-mail are required in the classroom setting, while library/ media centers and Internet-linked computer laboratories are the resources that will facilitate learning and teaching (Maier, Barnett, Warren, & Brunner, 1998). Technology is also needed to provide a bridge between teachers, students, parents, and the community. This will make communication more effective and easier among students, teachers and parents. Alongside the introduction of computers into the classrooms, are prerequisites for creating the right learning environment, enhancing learners' fluency and professional competency, and for guaranteeing technical support and facility maintenance (Smith, 2001). This means that providing schools with technology equipment is not enough to create a Smart School. Rather technology must involve the production of codified and tacit knowledge in the form of the application of knowledge, resource materials, tools and skills in designing, producing, and using products, their physical structures and systems extend human capability to control and modify natural and human-made environment (Raizen, Sellwood, Todd, & Vickers, 1995). In Malaysian Smart Schools, technology supplies are invested to enrich teaching/learning as well as management. For instance, TV, VCR and Radio sets are used to enable schools to access educational TV and radio programs. These equipment, together with the computers, secure the proper environment for cooperative learning. Internet access enables schools to obtain teaching/learning materials prescribed by the Ministry, students, and teachers that enrich the existing curricula (Smart School Project Team, 1997). Teachers, on the other hand, use computers to automate marking and recording of school-based tests. Administrators also use management software to handle the school's financial, staff development, student affairs, and curriculum management tasks. Each school is responsible for creating word processing and spreadsheets in addition to creating small databases for record keeping. In fact, Malaysia has managed in developing an effective and efficient management system of the school resources "The Smart Schools Management System (SSMS)". The SSMS is a software for management and administrative functions that enables principals and headmasters to perform their tasks efficiently when the main functions relating to school management such as scheduling lessons, annual academic activities and student academic records are all computerized (Zain, Atan, & Idrus, 2004). In the meantime, studies identify several interlocking factors with Egypt's education system that hinder the success of Smart School concept(El-Tawila, Lloyd, Mensch, Wassef, & Gamal, 2000; Kozma, 2004). The pedagogy, curriculum, and textbooks emphasize memorization of subject matter facts and principles. Based on this fact, Egyptian policy makers, teachers, and administrators need to move from considering ICT an extra course imposed on the educational program, already stuffed with unnecessary information, and start to perceive it as medium for revitalizing and enriching the learning process. Teachers need to invest the multimedia equipment available in their classrooms to stimulate thinking, creativity, and knowledge generation. While administrators need to benefit from the IT supplies stored in their offices in improving their administrative practices. Egyptian schools also suffer from a serious deficiency in management programs and multimedia courseware. Whereas, Malaysia has developed a skilled pool of IT experts who can be an attractive outsourcing option to Egypt especially as the cost of other professional experts in this arena is relatively high. Egyptian Smart Schools also need to learn from Malaysia that the effectiveness of IT mediated education depends mostly on expanding the margin of autonomy and academic freedom. This means that school authorities should allow and encourage teachers, staff, and students to use ICT facilities, such as the e-mail, internet, and other IT devises in order to stimulate creativity and knowledge production(Mae, 2004). Smart Schools dictates a shift in the teaching-learning concepts in many ways (Zaom, Atan, & Idrus, 2004). Learning shifts from receiving information to looking for relevant information, learning to apply information to solve problems, and communicating ideas. It is also accompanied by the development of higher levels of cognitive and creative abilities as will as the inculcation of values. It also encourages the development of a comprehensive set of teaching and learning materials is crucial to the implementation of Smart School. These materials include print-based materials, electronic media, and comprehensive teachers’ guides and manuals on how to integrate these materials into more student-center learning process. This shift in pedagogy presents a major challenge for the successful implementation of Smart School concept as teachers are normally familiar and comfortable with the traditional learning environment and any attempt to convince them that students should learn through discovery might have met with resistance from some of those who believe that knowledge flows from the teachers. Thus, the instructional integration of ICT into teaching is not simply a matter of asking teachers to change their pedagogical beliefs, but rather an ongoing process of gradual replacement based on experiences and skills developed through training (Cloke & Sharif, 2001). In fact, the introduction of ICT in classroomscompels teachers to change their understanding of pedagogy so that it becomes relevant and meaningfulfor the students and enables them to acquire thenecessary knowledge skills. The instructionalperspective of such classrooms would focus on theconstructivist approach rather than on the traditionalobjectivist approach (Duffy & Jonassen, 1992; Dunlap & Grabinger, 1996). This means that thelearning environment involves students workingcollaboratively rather than doing isolated work;learning is more active, student-centered, exploratoryand inquiry based than that existing in the traditionalpassive learning environment which isteacher-centered and focuses on factual and knowledge-based instruction (Fullan & Smith, 2001; Honebein, 1996; Idrus & Atan, 2002). In such environment, the teacher is no longer the wise man. The teacher's role has changed to one of providing guidance to the group. It is sort of a consultant's role, advising on how the work is done and making suggestions when something is missing. Students must feel that he/she is creating and originating his/her work and managing his/her knowledge. In other words today's ICT mediated education changes the whole concept of education as a result of restructuring schools with technology (Knapp & Glenn, 1996). Malaysia and Egypt have both identified teacher training as a top priority for the success of Smart Schools. Abdul Razak (2003) in his study argues that teachers need to be trained on different IT skills in reference to their specializations. For example, English teachers require special IT skill because English language teachers deal with more activities related to language competency and less technical competency (Abdul Razak, 2003). Therefore, although teachers realize the need for change implementation of real change is difficult. In this respect, McKenzi (2000) suggests that to overcome such problem schools need to create technology leaders in each field of study. Those leaders will provide other teachers with training based on their assessments of needs (McKenzie, 2000). Budget consideration should take into account funding sources and the various expenses incurred by Smart School operations, including hardware and software; personnel salaries; training and skills upgrading programmers; expansion; and equipment maintenance, repair and upgrading. The Malaysian Ministry of Education shouldered the cost of setting up the Smart School pilot phase and provided software necessary for development of school websites. The schools were allowed to purchase their own software to upgrade their respective websites. Maintenance, expansion and upgrading costs will also be borne by the MOE. The budget was a serious consideration in determining the network design, particularly, in regard to server capacity at the schools and at the Data Center, and bandwidth allocation (Asian and the Pacific Regional Bureau for Education, 2004). According to this agreement, resources are allocated to initiate projects in the area of capacity building, institutional empowerment and knowledge transfer to raise and upgrade the Egyptian work force skills. The Egyptian Smart School is one of the projects included the Italian Egyptian dept swap agreement(Italian Cooperation in Egypt, 2006a) in conjunction with the Ministry of Communication and Information Technology, the Ministry of Education, and the United Nation Development Program (UNDP) (MCIT & UNDP, 2007). Other bilateral and donor NGOs are also involved including the USAID (USAID, 2002). The Egyptian private sector takes its share in funding the Smart School project as part of the government's decentralization initiative that targets to increase the involvement of the civil society in national issues. Different private companies are invited to collaborate with schools on a cost recovery basis. The government's role is limited to supervise and facilitate the relationship and to empower partners as necessary. Obviously, the total responsibility of the Malaysian government in sponsoring Smart Schools has facilitated the situation of the schools within the country's national philosophy of education leading to the creation of autonomous and empowered schools. The Malaysian Smart Schools are dedicated to prepare loyal and unified Malaysian nation, through the preparation of citizens who believe in God, possess high moral standards, knowledge competence, and who are capable of achieving high personal well being (Mahathir, 1998). Although the philosophy of Egyptian Smart Schools is not clearly defined, the heterogeneity among sponsors might hamper reaching consensus and might represents a major obstacle as each of the partners has his own agenda that might contradict with the Egyptian national agenda. Therefore, emerging from the Malaysian experience the researchers highly recommend that the Egyptian government should set the conceptual blueprint of Smart Schools. All national and international agencies that are involved in the project must commit themselves to this framework. Also, the Egyptian government should insist on practicing its right for supervision as education is a homeland security issue that cannot tolerate manipulation. To finalize our discussion we like to emphasize that Smart Schools are schools with a vision of a learning community that steeps in thinking, deepens understanding, and produces students ready to face the world as responsible, thinking members who cherish and respect diversity. Education in such school should inspire creativity and innovation, and enhance students' ability to apply knowledge and solve emerging problems with confidence. However, as we learned from the Malaysian and Egyptian experiences, the fulfillment of Smart School's mission requires time, money, and dedication, but there is pay-off eventually. Abdul Razak, N. (2003). Computer Competency of In-Service ESL Teachers in Malaysia Secondary Schools. Unpublished PhD, University Kebabgsaan, Bangi, Malaysia. Abramovitz, M., & David, P. (1996). Employment and Growth in the Knowledge-based Economy, Technological Change and the Rise of Intangible Investments: The US Economy’s Growth-path in the Twentieth Century. Paris: OCDE. Abramovitz, M., & David, P. A. (Eds.). (1998). American Macro Economic Growth in the Era of Knowledge Based Progress: The Long -Run Perspective (Vol. 3). New York: Cambridge University Press. Asian and the Pacific Regional Bureau for Education. (2004). Integrating ICTS in Education: Lessons Learned: A collective Case Study of Six Asian Countries. Bangkok: UNESCO. Astiz, M. F., Wiseman, A. W., & Baker, D. P. (2002). Slouching towards Decentralization: Consequences of Globalization for Curricular Control in National Education System. Comparative Education Review, 46(1), 66-88. Bajunid, I. A. (2001). The Transformation of Malaysian Society through Technological Advantage: ICT and Education in Malaysia. Journal of Southeast Asian Education, 2(1), 104-146. Brusoni, S., Marsili, O., & Salter, A. (2005). The Role of Codified Sources of Knowledge in Innovation: Empirical Evidence from Dutch Manufacturing. Journal of Evolutionary Economics, 15(2), 211-231. Carnoy, M. (1999). Globalization and Educational Reform: What Planners Need to Know. Paris: UNESCO. Carnoy, M., Castells, M., Cohen, S. S., & Henrique, F. (1994). The new global economy in the Information Age. University Park, PA: Penn State University Press. Carnoy, M., & Rhoten, D. (2002). "What Does Globalization Mean for Educational Change? A Comparative Approach. Comparative Education Review, 46(1), 1-9. Chatterji, S. (1995). Proceedings of the International Congress of Mathematicians. In S. D. Chatterji (Ed. ), Proceedings of the International Congress of Mathematicians (pp. 1- 16). Basel: Virkhauser Verlag. Cloke, C., & Sharif, S. (2001). Why use information and communication technology? Some theoretical and practical issues. Journal of Information Technology for Teacher Education, 10(1-2), 7-18. Dale, R., & Robertson, S. L. (2002). The Varying Effects of Regional Organizations as Subject of Globalization of Education. Comparative Education Review, 46(1), 1-12. Dasgupta P, D. P. (1994). Toward a new economics of science. Research Policy, 23(5), 487-521. David, P. A., & Foray, D. (2002). Introduction and general perspectives: An introduction to the economy of the knowledge society. International Social Science Journal, 54(171), 9-23. Davies, S., & Guppy, N. (1997). Globalization and Educational Reforms in Anglo-American Democracies. Comparative Education Review, 41(4), 435-459. DiMaggio, P. J., & Powell, W. W. (1991). introduction to The New Institutionalism Organizational Analysis. In W. W. Powell & P. J. DiMaggio (Eds. ), Institutionalism in Organizational Analysis (pp. 1-38). Chicago: University of Chicago Press. Drucher, P. F. (1999). Knowledge-worker productivity: The biggest challenge. California Management Review, 41(2), 79-94. Drucker, P. (1998). From Capitalism to Knowledge Society. In D. Neef (Ed. ), The Knowledge Economy (pp. 1-15). Woburn MA: Butterworth. Duffy, T., & Jonassen, D. (1992). Constructivism: new implications for instructional technology. In T. M. Duffy & D. H. Jonassen (Eds. ), Constructivism and the Technology of Instruction (pp. 1-16). Mahwah, NJ: Lawrence Erlbaum Associates. Dunlap, J., & Grabinger, R. (1996). Rich environment for active learning in higher education classroom. In B. G. Wilson (Ed. ), Constructivist Learning Environment: Case Studies in Instructional Design (pp. 65-82). Englewood Cliffs, N.J: Educational Technology Publication. El-Tawila, S., Lloyd, C., Mensch, B., Wassef, H., & Gamal, Z. (2000). The school environment in Egypt: A situation analysis of public preparatory schools. New York: Population Council. Ergazakis, K., Metaxiotis, K., & Psarras, J. (2006). Knowledge cities: the answer to the needs of knowledge-based development. VINE, 36(1), 67 - 84. European Commission. (2000). E. Europe: An information society for all. Brussels, Belgium: European Commission. Foong-Mae, C. (2002). 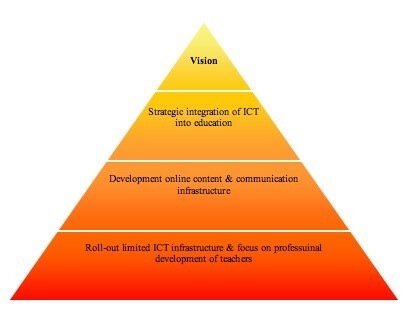 ICT in Malaysia schools: Policy and strategies. Paper presented at the Seminar /Workshop on the Promotion of ICT Education to Narrow the Digital Divide, Tokyo, Japan. Forst, & Sullivan. Benchmarking of the Smart School integrated solution: Educating hearts and minds. Malaysia: Multimedia Development Corporation. Freeman, C., & Soete, L. (1997). The Economic of Industrial Innovation (3 ed.). London: London and Washington Printer. Fullan, M., & Smith, G. (2001, 27-28 August). Technology and the problem of change. Paper presented at the International Educational Conference, Petaling Jaya, Malaysia. Gitta, C. (2001). Getting Connected: Information and Communications Technology for Development. New York: UNDP. Grossman, G., & Helpman, E. (1994). Endogenous Innovation in the Theory of the Growth. Journal of Economic Perspectives, 8(1), 23-44. Guppy, D., Meyer, J. W., Boli, J., & Ramirez, F. (1997). World Society and the Nation State. American Journal of Sociology, 103(1), 144-181. Hagedoorn, J., Link, A. N., & Vonortas, N. (2001). Research Partnership. Research Policy, 29, 567-586. Halim, A. H. A., Zain, M. Z. M., Luan, W. S., & Atan, H. (2005). The taxonomical analysis of science education software in Malaysian Smart Schools. Malaysian Online Journal of Instructional Technology (MOJIT), 2(2), 106-113. Held, D., McGrew, A., Goldblatt, D., & Perraton, J. (1999). Global Transformations. Stanford: Stanford University Press. Honebein, P. (1996). Seven goals for the design of constructivist learning environments. In B. G. Wilson (Ed. ), Constructivist Learning Environment: Case Studies in Instructional Design (pp. 11-24). Englewood Cliffs, NJ: Educational Technology Publication. Huang, C. J. (2000). Application of the Smart Schools of Malaysia to Taiwan's technology education. Paper presented at the PATT-10 Conference, Utah, USA. Idrus, R., & Atan, H. (2002, July 29-August 4). Computer Mediated Communication (CMC): a shift towards e-education in Malaysia. Paper presented at the International Conference on Advances in Infrastructure for e-Business, e-Education, e- Science and e-Medicine on the Internet, L'Aquila, Rome, Italy. International Telecommunication Union (ITU). (2002). Multimedia Malaysia: Internet Case Study. ITU. Retrieved, from the World Wide Web: www.itu.int/ITU-D/ict/cs/malaysia/material/mys%20cs.pdf. Internet Usage in Asia. (2003). Internet Users and Population Statistics for Asia. Internet World Stats. Retrieved, from the World Wide Web: www.internetworlds.com/asia.htm. Kirschner, P., & Davis, N. (2003). Pedagogic benchmarks for information and communications technology in teacher education. Technology, Pedagogy and Education, 12(1), 125-147. Klepper, S., & Simons, K. (1997). Technological Extinctions of Industrial Firms: An Enquiry into their Nature and Causes. Industrial Corporate Change, 6, 379-460. Knapp, L. R., & Glenn, A. D. (1996). Restructuring schools with technology. Boston: Allyn and Bacon. Kozma, R. B. (2004). Technology, economic development, and educational reform: Global changes and an Egyptian response. Arlington, VA: Pal-Tech. Kozma, R. B. (2005). National Policies that connects ICT-Based Education Reform to Economic and Social Development. An Interdisciplinary Journal on Humans in ICT Environments, 1(2), 117-156. Langlois, R. N. (2001). Knowledge, consumption, and endogenous growth. Journal of Evolutionary Economics, 11(1), 77-93.
evidence on some Schumpeterian hypotheses. American Economic Review, 75, 20-24. Lucas, R. E. (1988). On the Mechanics of Economic Development. Journal of Monetary Economics(22), 24-45. Lundvall, B. (Ed.). (1992). National Systems of Innovation: Towards a theory of Innovation and Interacting Learning. London: London Printer Publishers. Mae, C. F. (2004). School Networking: Lesson Learned. Bangkok: UNESCO Asia and Pacific Regional Bureau for Education. Mahathir, M. (1998). The Way Forward - Vision 2020. London: Weidenfield and Nicholson Publications. Maier, P., Barnett, L., Warren, W., & Brunner, D. (1998). Using Technology in Teaching and Learning. London: Kogan Page. Marginson, S. (1999). After Globalization: Emerging Politics of Education. Journal of Educational Policy, 14(1), 19-31. Marginson, S., & Rhoades, G. (2002). The Enterprise Universities: Power, Governance and Reinvention in Australia. Cambridge: Cambridge. MCIT, & UNDP. (2007). Egypt ICT Trust Fund: Information and communication technology foster Egypt's sustainable human development program. Cairo: Egypt ICT Trust Fund. McKenzie, J. (2000). How teachers learn technology best. Bellingham: FNO Press. Nadu, T. (1998). Curriculum Guide and Syllabus for Information Technology in Schools. Paper presented at the UNESCO World Conference on Higher Education in the Twenty-First Century, Paris. Nelson, R. (Ed.). (1993). National Innovation Systems: A comparative Study. New York: Oxford University Press. OECD. (1999). The Knowledge Based Economy: A set of Figures and Facts. Paris: OECD. Pope, M., Musa, M., Singaravelu, H. T., & Bringaze, M. R. (2002). From colonialism to ultranationalism: History and development of career counseling in Malaysia. Career Development Quarterly, 50(2), 190-225. Prakash, A., & Hart, J. A. (1999). Globalization and Governance. London: Routledge. Raizen, S. A., Sellwood, P., Todd, R. D., & Vickers, M. (1995). Technology Education in the Classroom. San Francisco, CA: Jossey-Bass. Ramasamy, B., Chakrabartya, A., & Cheahb, M. (2003). Malaysia’s leap into the future: an evaluation of the multimedia super corridor. Technovation, 24(11), 871-883. Romer, P. M. (1994). The origin of Endogenous Growth. Journal of Economic Perspectives, 8, 3-22. Sharif, A. M., & San, K. M. (2001). The Invention curriculum: A Malaysian Experience. Kuala Lumpur: Malaysia: Ministry of Education. Smith, G. (2001). So what difference are computers making in classroom for students? Paper presented at the International Educational Conference, Petaling Jaya, Malaysia. Stromquist, N., & Monkman, K. (Eds.). (2000). Globalization and Education: Integration and Contestation across Cultures. Lanham, Maryland: Rowman & Littlefield Publishers, Inc.
UNDP. (2002). Arab Human Development Report 2002:Creating Opportunities for Future Generations. Arab Human Development Report 2002:Creating Opportunities for Future Generations: UNDP. Winter, S. G. (1987). Knowledge and Competence as strategic assets. In T. D. J (Ed. ), The Competitive Challenge: Strategies for Industrial Innovation and Renewal (pp. 159-184). Cambridge MA: Ballinger Publishing Company. Zain, M. Z. M., Atan, H., & Idrus, R. M. (2004). The impact of information and communication technology (ICT) on the management practices of Malaysian Smart Schools. International Journal of Educational Development, 24, 201-211. Zaom, M. Z. M., Atan, H., & Idrus, R. M. (2004). The impact of information and communication technology (ICT) on the management practice of Malaysia Smart Schools. International Journal of Educational Development, 24(2), 201-211. Ziesemer, T. (1995). Growth with imported capital goods, limited export demand and foreign debt. Journal of Macroeconomics, 17(1), 31-53.